So said defending track champ Isaac Sneeringer after scoring the 2.53-second win in the 25-lap “358” sprint car feature at Trail-Way Speedway Friday night. Sneeringer won on his first night out, just days after his crew picked up and dropped a new Don Ott motor into the DCI/D.E. Wildasin and Son #19Z. Sneeringer started sixth, took second from Seth Kearchner on lap seven, and chased down race-long leader Cody Fletcher over the next ten laps before passing the #66A on the backstretch of lap 18. From there, he drove away to his 13th career Trail-Way win, with Kearchner crossing second and hard charger Mike Bittinger (who started 15th) third. Completing the top five were 12th-starting Doug Hammaker and Fletcher. Rounding out the top ten were 11th-starting Randy Whisler, Chris Frank, Bobby Howard (racing at Trail-Way for the first time in 10 years), Brandon Noel, and Dave Thrush. Heats for the 16 “358” sprints were won by David Holbrook and Fletcher. Holbrook started on the pole but dropped to the infield in the back stretch of the first lap. Bernville’s Hayden Miller started on the pole and dominated the 20-lap 600cc micro-sprint feature, crossing 3.25 seconds in front of Travis Scott. Jim Young, 12th-starting Tyler Walton, and Bo Gordon finished third through fifth. Qualifiers for the 17 micros were won by Scott and Walton. Mason Chaney made a last-turn pass around Chad Ernst to score a thrilling first career win in the 20-lap ServiceMaster Clean Central PA Legends feature. Chris Transeau started on the outside pole and led the first eight laps. Chad Earnst, who started fourth, claimed the lead on lap nine. One lap later Transeau and Bill Diehl got together while racing for second in turn two. Transeau went to the rear and Diehl was cited for roughriding, also sending him to the rear. Travis McClelland assumed second and Chaney third for the restart. Chaney, who was losing his brakes, went to the top, drove around McClelland for second with one lap to go, and charged around Earnst on the final turn. Earnst settled for second, with McClelland third, Greg Burd fourth, and Austin Bellamare fifth. Heats for the 13 Legends were won by Bob Stough and Transeau. Matt Chronister became Trail-Way’s all-time winner in the 15-lap limited stock feature, claiming his 33rd career win by 3.91 seconds over points leader Justin Wagaman. Chronister started on the outside pole and led the first seven laps before yielding to brother Jason Chronister. The Chronister brothers split a lapped car coming off turn four of lap ten. Jason, who may have struck the outside wall, dropped to fourth moments later, handing the lead back to Matt. Matt led the rest of the way, with Wagaman, Ricky Weaver, Jr., 11th-starting Chad Weaver, and tenth starting Joseph Bowling (running in only the second race of his career) completing the top five. Heats for the 20 limited stocks were won by Wagaman and Robbie Carroll, who was unable to start the feature event. Next Friday, April 29, Trail-Way swings back into action with the Precise Racing Products 358 Late Models. Joining the Late Models will be the Limited Stocks, Vintage Cars, Street Stocks and the Mason-Dixon 270 Micro Sprints sponsored by Lucas Oil. 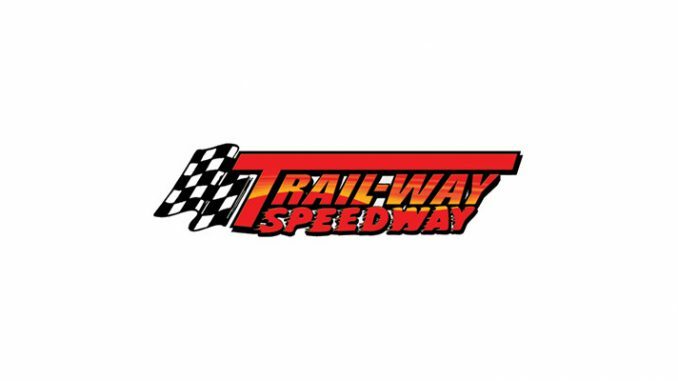 This will be the first of two consecutive Friday nights that Trail-Way will invite students to attend a night at the races, for free. Bring your ID card for free general admission entry! Gates open at 5:30 p.m. and heats begin at 7:45 p.m. The following Friday night, May 6, the 358 Sprints return to Trail-Way along with the ServiceMaster Clean Central PA Legends, Limited Stocks and the Mason Dixon 270 Micro Sprints sponsored by Lucas Oil. For the second week in a row, Trail-Way is inviting students to the races for free! Bring your ID card for free general admission entry and enjoy a jam-packed night of exciting side-by-side racing action! Gates open at 5:30 p.m. and heats begin at 7:45 p.m.
HOOSIER TIRE MID-ATLANTIC 358 SPRINT CARS FEATURE (25 Laps) – 1. 19Z-Isaac Sneeringer; 2. 30-Seth Kearchner; 3. 12-Mike Bittinger (Hard Charger); 4. 66-Doug Hammaker; 5. 66A-Cody Fletcher; 6. 64-Randy Whisler; 7. 00-Chris Frank; 8. 90X-Bob Howard; 9. 10B-Brandon Noel; 10. 22T-Dave Thrush; 11. 4-Dwight Leppo; 12. 10-Zach Euculano; 13. 17-George Streaker, Jr.; 14. 77K-Steven Kisamore; 15. 77-David Holbrook (DNF); 16. 39-JB Cunningham, Jr. (DNF). No time. Lap Leaders: Cody Fletcher (1-17); Isaac Sneeringer (18-25) 358 Sprint Heat 1 Finish (10 Laps/All Qualify) – 1. 77-David Holbrook; 2. 00-Chris Frank; 3. 22T-Dave Thrush; 4. 10-Zach Euculano; 5. 4-Dwight Leppo; 6. 64-Randy Whisler; 7. 17-George Streaker, Jr. (DNF); 8. 12-Mike Bittinger (DNF). Time – 2:27.65 358 Sprint Heat 2 Finish (10 Laps/All Qualify) – 1. 66A-Cody Fletcher; 2. 30-Seth Kearchner; 3. 19Z-Isaac Sneeringer; 4. 90X-Bob Howard; 5. 66-Doug Hammaker; 6. 10B-Brandon Noel; 7. 77K-Steven Kisamore (DNF); 8. 39-JB Cunningham, Jr. (DNS). No time.